The Great War centenary commemorations are something of an embarrassment for me. The obvious family war stories are lacking among my ancestors. In particular, no-one was an acknowledged hero, and nobody died. I suppose one could regard Nana’s sister, Ethel, as a war death, at a stretch. She died in 1918, in the Spanish Flu epidemic, according to Mum. However, dying of pneumonia during an epidemic doesn’t necessarily qualify as death due to Spanish Flu, so Ethel remains an unsubstantiated casualty. I could claim Grandad Webb as a “near miss”, as he was shot in the head, but survived with a long scar on his skull and, I suspect, an even deeper scar in his mind. But exactly how he received the head wound is an unknown, and likely to remain so, as his service records have not survived. Most of Grandad’s brothers were enlisted in the Army, and seem to have survived unscathed. Two of Nana’s brothers had joined the Militia prior to the War, but I cannot find records for them of any War service or medals. It’s possible that neither was fit enough. The experience of children like my mother and father and their siblings, who were growing up during the First World War, intrigues me. Children’s experience in the Second World War is well-documented, but I have as yet found little research on childhood in the Great War, at either a local or national level. Among my father’s family, evidence of military service is scant. His father and uncle were too old for military service and, as dockworkers, I suspect they may have been considered as being in a “reserved” occupation, although I have yet to research that particular topic. 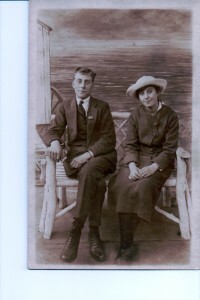 Their children were mostly too young to be conscripted, apart from George, my father and the eldest. He chose to join the merchant navy, as a Marconi radio operator. This was a hazardous occupation even in 1918, by which time ships were mainly sailing in convoy for protection against U boats. I wish I could say that my Auntie Queenie and Auntie Elsie had become war heroines as munitions workers, or nurses, the Land Army, or even drivers or bus conductresses. They left school to work for the Post Office as telephonists, so I shall ascertain whether this exemplifies women taking over a traditional male occupation before awarding them brownie points.This is all rather a mixed blessing. Actually, I feel rather relieved that I don’t have to spend the next four years compiling family stories of Tommies in mud and trenches in Flanders. Instead I shall drill down into wartime lives on the Home Front, at sea in merchant ships, and maybe a tale or two of distant cousins involved in the global conflict in far-flung places. Anyone for the East Africa Campaign? I recently saw three short plays about women in WW1. One in particular was very interesting, The Old Lady Shows Her Medals by JM Barrie (he who wrote Peter Pan). It concerned a woman who felt so ashamed at not having a son or husband fighting that she forged a correspondence with a soldier who shared her surname, so she could show off his letters to her women friends.